Gil Gutiérrez is a master guitarist who has performed at the Kennedy Center, Carnegie Hall, and in intimate venues like the Jazz Standard in New York City. In recent years, he has performed with symphony orchestras and jazz combos; over the last decade, he has been a member of the San Miguel 5, Doc Severinsen’s current group, which has several performances scheduled this year to celebrate Doc’s 90th birthday. Gutiérrez maintains a busy performance schedule in America and at home in Mexico, but perhaps the most fulfilling way to experience his ongoing musical exploration is in an intimate setting such as a wood-lined parlor while he is at work in a small group, such as in a trio with violinist Robert Stern and bassist David Rodriguez. Hmmmm. On Saturday, May 13, Gil Gutiérrez, Stern, and Rodriguez will bring their music to the Barbara Fite Room at Opus 40 in Saugerties, New York. Tickets are available for $30 in advance, $40 at the door. Tickets are available online through PayPal, or by calling (845) 246-3400. There are a handful of places and objects on the planet that photography under serves. Opus 40, in Saugerties, New York, is one of them. 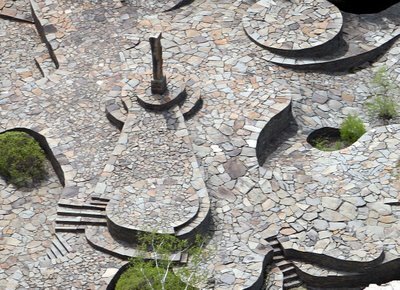 Built in an abandoned bluestone quarry in upstate New York by one man, Harvey Fite, Opus 40 is a contemporary American version of Stonehenge or the collection of Easter Island moai. It is one of my favorite places. Fite was a sculptor and fine arts professor at nearby Bard College when he purchased the bluestone quarry. If you have ever walked on a sidewalk in Manhattan, you have walked on bluestone from this or a nearby location. Using the rubble that had not become NYC sidewalks, Fite filled one six-and-one-half-acre section with hand-laid circles of bluestone paths and ramps, leading nowhere and everywhere, from fifteen feet below the ground level up to the magnificent centerpiece, the obelisk, a nine-ton, three-story-tall single stone, which from different perspectives seems to point at the nearby Catskill Mountains, join with the range, or appear to be the reason the Catskills are there. And Fite did it all alone, using ancient techniques. At first intended to be a showcase for his sculpture, over the next 37 years the site itself became Fite’s life work. He died in 1976. If I had not been a student at Marist College, where Harvey Fite’s stepson Tad Richards was teaching, I quite possibly would still not know of Opus 40’s existence, even though I live an hour away. My teacher-friend grew up at Opus 40 and he still resides there. In the early ’90s, I attended a friend’s wedding at Opus 40, and in the summer of 1998, I volunteered there, and helped direct parking for that year’s music acts. The quarry is a natural amphitheater and the obelisk is an eye-grabbing stage set; the concerts that summer included a blues festival, Orleans, and Pat Metheny.